Big news out of Lebanon, breaking just now, story here alJazeera English, violence is breaking out between street forces of Hezbollah and the Sunni government of Fouad Sinora. As of now, it seems, the Lebanese Army is trying to stay out of the fight. Sheik Nasrallah, head of Hezbollah, gave a speech on TV saying that a recent government initiative to prevent their telephone networks (used for surveillance??) was equivalent to a declaration of war by the pro-Sunni government factions. Fears that the political conflict in Lebanon could escalate into sectarian conflict were heightened when Mohammed Rashid Kabbani, Lebanon’s Sunni grand mufti, spoke against Hezbollah for the fist time. “Sunni Muslims in Lebanon have had enough,” Kabbani said in a televised address from his office. The Sunni spiritual leader referred to Hezbollah as “armed gangs of outlaws that have carried out the ugliest attacks against the citizens and their safety”. As Seymour Hersh detailed in the New Yorker more than a year ago, the US was helping to arm/train/supply (mostly through proxies like Saudi Arabia) Sunni militias to help undermine Hezbollah (which is Shia and allied with Iran). A great piece here from Andrew Lee Butters, Time’s Lebanon man for the Middle East Blog who lives in Beirut, detailing the creation of Awakening-like Sunni groups in neighborhoods to protect against Shia ethnic cleansing. Check back to that site as likely he will be a key blogger as this story continues. Also from al-Jazeera, more gun battles/street fighting in Sadr City, the Shia stronghold of Baghdad. The US and its (more pro-Iranian) Shia allies in the (so-called) Iraqi Government (really just the Dawa and ISCI militias) are cutting off supplies to neighborhoods seen as pro-Sadr (BBC). Similar to the policy the US and Israel have been employing by cutting of the West Bank (due to its election of Hamas). The BBC article linked above details the looming humanitarian disaster in Baghdad–the entire country is a humanitarian disaster but that’s a different for another day. Football stadiums are being prepared for the exodus of civilians who are getting caught in the fight between the Mahdi Army and the US Army. Expect more disaster to follow (think New Orleans Superdome). The worse possibility is now a coordinated multi-prong attack on all these fronts, showing up this idea the US has been pushing for, for an anti-Iranian (i.e. anti-Shia) alliance in the Middle East. Saber rattling with Iran is increasing, John Bolton is openly calling for strikes on Iran, Kuwaiti Sunni is claiming Iran is funding AQI, and the US continue to try to argue that Iran is the main backer of Sadr and attacks on the US military (as opposed to Iran actually being the main source of training/funding for the Iraqi Government which is why Mahmoud Ahmadinejad was given a hero’s welcome on his recent trip). This is all very fishy and scary frankly. What is unclear would be if the US were to use air strikes on Iran, how would the Supreme Islamic Council Badr Corps (i.e Iraqi security forces) respond–would they turn on the American military? We know the Sadrists would rise up against the US. We also know the Iranians would unleash their own Revolutionary Guards/al-Quds elements across the border to attack. And Hezbollah would likely attack Israel unless of course they are too busy fighting Sunni in Lebanon. I guess they could leave Hamas to do the attacking of Israel. We are not quite there yet, so I don’t want to be too alarmist, but a lot of chess pieces are moving into position. So the backstory (Cole most info. on this) is that delegations from PM Maliki’s own party and allied group (Dawa and SIIC respectively) against the Prime Minister it would appear goes to the Holy Seminary City of Qom in Iran (where Moqtada is studying to become an Ayatollah) and makes a deal with him. Sadr sets the terms of the ceasefire and it appears keeps very open the door to violence should his demands not be met. Put a fork in Maliki. For Robb: “Further, any internal dissension [within the Mahdi Army] that existed before the event due to a ceasefire is now gone.” The key as his analysis always points out is not large scale command and control structures imposed from above–or attempted to be imposed in the case of Maliki–but local power from the street, networked organization, and playing defense as prime strategy. For the official spin from the right, Ed Morrisey here (“Remind Me Again Who Is Losing Basra?”). Easy answer: Not the guy he thinks. Even Allahpundit (co-blogger on Hot Air with Morrisey) isn’t buying that line. Well given that the Quds Force did broker this deal in Iraq….asking about would you rather have is the wrong question. Better to ask what you do have. The Maliki has never and will never be in control. That fact has been made crystal clear by this episode. The Mahdi Army gains further cred, which means (as Robb points out) any casualties they took in this fight–particularly by standing up to US firepower–will be filled and then some by new recruits. No government in Iraq can gain legitimacy after being installed by the US. Period. Moqtada al Sadr has called for his fighters off the street in exchange for amnesty for his captured folk and the end of US/Iraqi Gov’t raids on his militia. “Because of the religious responsibility, and to stop Iraqi blood being shed, and to maintain the unity of Iraq and to put an end to this sedition that the occupiers and their followers want to spread among the Iraqi people, we call for an end to armed appearances in Basra and all other provinces. If you caught that dig, the sedition of the occupiers followers means that the Shia Iraqi Government of Nuri al-Maliki and the Supreme Islamic Iraqi Council, whose Badr Corps is de facto the Iraqi Army. What I have not seen anyone comment upon is that this ceasefire offer is conditional in its formulation. What if Maliki and Crew do not proclaim an amnesty, release some prisoners, and cease their raids? Will the JAM (Jaish-al Mahdi, Mahdi Army) then re-break the truce and return to attack mode? There is some discrepancy whether the US Army was given a heads up by Maliki that this attack was coming, but either because the Iraqi Army was unable to defeat the Mahdi Army (either in Sadr City in E. Baghdad or in Basra), the US was called in with air strikes. Air strikes. In a country said Army is occupying. Meaning civilians are now dead. That said, it looks like the cease-fire’s mostly holding, because if it truly disintegrates things in Baghdad will be A LOT worse (much more street fighting, a lot more EFPs and rocket attacks, etc.). I think it all depends on whether the Basra fighting drags on for a while or wraps up. My complete guess is that it will wrap up sooner rather than later, because the militias will make the same decision Sunni insurgents made over and over again, and just fade into the crowd after putting up some resistance. Their power in the south is as much political as military; I don’t necessarily think that Maliki planting a flag in the center of town will really change things in the long-term. So I guess I’m anticipating something close to the “best-case scenario” — which, this being Iraq, pretty much means that a lot of people will die and things won’t change, as opposed to a lot of people dying just to make things worse than they were before. That said, I think I’m more optimistic about this than a lot of people. That is the clearest description of the realty of Iraq I’ve read ever I think. All these groups have to do is wait out the US Army and be able to defeat the Iraqi Army (or at least not be defeated by them). Update I: Speaking of Ackerman, here he is on the LiberalOasis Radio Show discussing foreign policy. They discuss his very good article on the Obama Doctrine and McCain as Bush-Plus. Listen to one of his final point. The reason foreign fighters (aka al-Qaeda in Iraq) enter Iraq is that they are shown photos of Abu Ghraib and the American occupation. Update II: If you want to see how this story of Sadr’s call for a ceasefire gets interpreted/spun on the we’re winning in Iraq right, this piece from Ed Morissey. A couple of corrections to Ed’s piece. 1)The British leaving did not create a power vacuum in Basra–the British never controlled Basra. For a year or more they were holed up taking mortar fire on their base. 2)While Captain Ed clearly grasps the intra-Shia nature of the conflict, his pro-war outlook keeps him blinded to the fact that Sadr is playing it cagey as always (lying low) and that the Iraqi Army is really fighting for the pro-Iranian Badr Corps not al-Maliki’s central government. 3)The ceasefire has been called only because the US had to get involved via air strikes (i.e. the Iraqi Army can’t beat the Mahdi Army without the US). Every time the US has to send in air attacks to defeat the Mahdi Army backing Maliki, Maliki is further seen as a tool of the occupation and loses legitimacy. Remember for Shia theology, the image of the persecuted, holy warrior is the most important source of legitimacy. Reports of Sadr’s imminent demise have been greatly exaggerated every year of this conflict by compatriots of Ed’s. I wouldn’t so easily count him out. Very smart piece. In Asian Times. But the Badr Organization had become the indispensable element of the Iraqi government’s security forces, who could be counted on to oppose the Mahdi Army in the south. And in a further ironic twist, it was the leaders of the ISCI and of the Nuri al-Maliki government, which depended on Iranian support, who insisted last summer and autumn that the US should credit Iran with having prevailed on Muqtada to agree to a ceasefire. The close collaboration of the US command with these pro-Iranian groups against Muqtada appears to be the main reason for the State Department’s endorsement of that argument last December. Porter refers to two pillars of Petraeus’ strategy–one being the self-imposed ceasefire (hudna) by Sadr and his Mahdi Army. The other he does not mention but it is clearly the Sunni Awakening Movement. Unfortunately that second pillar is a tad wobbly at the present moment as well. To be fair and balanced on this one, the US contradictions are certainly in place–and they go deeper than Gareth mentions. The US’ two main Iraqi allies–the Kurds and the SIIC are both in favor or regional autonomous zones which works against the stated goal of US policy (unified Iraq). Sadr (whose anti-occupation, anti-American) is actually in favor of an unified country and strong central government (another US plank). And the SIIC is attacking now because the Mahdi Army would win in a coming new set of provincial elections in the South most likely. So the US is supporting an Iranian-backed militia to destroy a party so that free and fair elections don’t take place–though again the official policy is democracy for the country. How’s that for democracy promotion? So all that is certainly the case. But what is also clear is that Iran has been playing both sides (5 dimensional chess game they play) in the Shia fight. That way they can continue influence however it eventually shakes out between Sadr and Hakim and their respective crews. Oh and by the way, the Mahdi Army (unsurprisingly) is beating the Iraqi Army. If the British couldn’t get rid of the militias in the South, if the US couldn’t dislodge the insurgency in Iraq (eventually they just bought them off–see story above on how we are late in our payments….not smart), and the Israelis couldn’t destroy Hezbollah–how the hell is the Iraqi Army going to de-legitimate and destroy the Mahdi Army? The Sadrists simultaneously win power on the streets through strength/resistance and by being viewed as being persecuted by unjust ruler (Maliki seen as US stooge). This has deep resonance in Shia Islam which is built around the martyrdom and persecution of Imam Husayn. (Recall that Moqtada’s father was murdered by Saddam and his thugs). Nir Rosen, Arabic-speaking American Journalist, who is the (THE) source for reporting on the insurgency, life on the ground in Iraq, and the feel of the country, comes back with another disturbing, eye-opening account from his recent trip. This one concerns the creation of Awakening Councils (Sawha in Arabic) aka local citizen groups in Sunni neighborhoods. The effect? Funding both sides of a Civil War which is looking to reignite once the Americans leave. The Iraqis do not resist — they are accustomed to such treatment. Raids by U.S. forces have become part of the daily routine in Iraq, a systematic form of violence imposed on an entire nation. A foreign military occupation is, by its very nature, a terrifying and brutal thing, and even the most innocuous American patrols inevitably involve terrorizing innocent Iraqi civilians. Every man in a market is rounded up and searched at gunpoint. Soldiers, their faces barely visible behind helmets and goggles, burst into a home late at night, rip the place apart looking for weapons, blindfold and handcuff the men as the children look on, whimpering and traumatized. U.S. soldiers are the only law in Iraq, and you are at their whim. Raids like this one are scenes in a long-running drama, and by now everyone knows their part by heart. “I bet there’s an Iraqi rap song about being arrested by us,” an American soldier jokes to me at one point. Gang on gang warfare, power devolved to the local level with local gangs & guns, and the Americans played by both sides within that game. That’s victory to some. The Sunnis are arming for another attack on the Shia post-American draw down. The Mahdi Army is using the US Army to prune its movement of rogue elements. Everyone is using a traditional medieval imperial Islamic technique of a hudna, to gain a better position, and then re-start hostilities when the situation improves. Huge news out of Iraq today. Moqtada al Sadr–head of the Sadrist movement and the Mahdi Army–has renewed the ceasefire (hudna in Arabic) that he put in place six months ago. The cleric, whose forces have frequently clashed with the Americans in the past, had sealed envelopes distributed to Friday preachers in Shia mosques with instructions that they should be opened and read at Friday prayers. In the statement read out from the pulpits Mr Sadr ordered the Mehdi Army to continue suspending all military activities for a further six months until August. The aim, it said, was to give the movement an opportunity to retrieve what it called its ideological position. 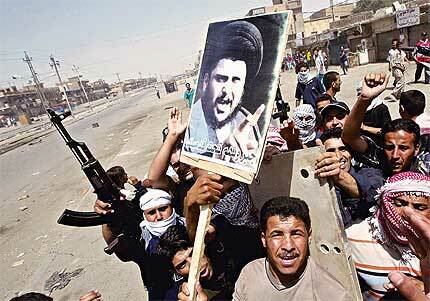 What this ceassation of hostilities allows is for Sadr to prune the movement of what he calls rogue elements. He is by far the cagiest politician in Iraq and while this move may be seen (and probably will on the right perhaps not without some reason) as a fear of taking on the US Army in surge mode and therefore as weakened, Sadr knows that the real power lies in the street not with the Parliament. He can bide his time and wait out until the Americans start the inevitable draw down of forces. Kurds in North: strong/smart authoritarian one-party state (a compromise of the two feudal previously in-fighting Kurdish clans: Barzanis and Talabanis). Healthy blue pushing into orange. Shia in South. Powerful on-coming theocratic blue (Shia Rising). Religious vigilantes have killed at least 40 women this year in the southern Iraqi city of Basra because of how they dressed, their mutilated bodies found with notes warning against “violating Islamic teachings,” the police chief said Sunday. Maj. Gen. Jalil Khalaf blamed sectarian groups that he said were trying to impose a strict interpretation of Islam. They dispatch patrols of motorbikes or unlicensed cars with tinted windows to accost women not wearing traditional dress and head scarves, he added. Basra, recall in the South is labeled one of the “safe” zones of the country, given that since it is totally Shia, not Shia-Sunni civil war there. Basra is also the home of the major port/oil fields of Iraq (80% of total oil capacity) and is currently a war zone between three Shia (blue) factions: Supreme Islamic Iraqi Council (pro-American and pro-Iranian); The Mahdi Army of Moqtada al-Sadr (currently in cease-fire with US Army, generally anti-American occupation, and more nationalist/less pro-Iranian than SIIC); The Islamic Virtue Party (Fadhila), a split off of the Sadrist movement. For fascinating video of this fight in Basra, here (via Democracy Now). The oil money is grafted by the millions. The city is run by militias, organized gangs, mafia style. And now the rise of pathological blue in S. Iraq. Shia Talibanization. Note: [On the use of Spiral Dynamics as a theory with colors, see here].